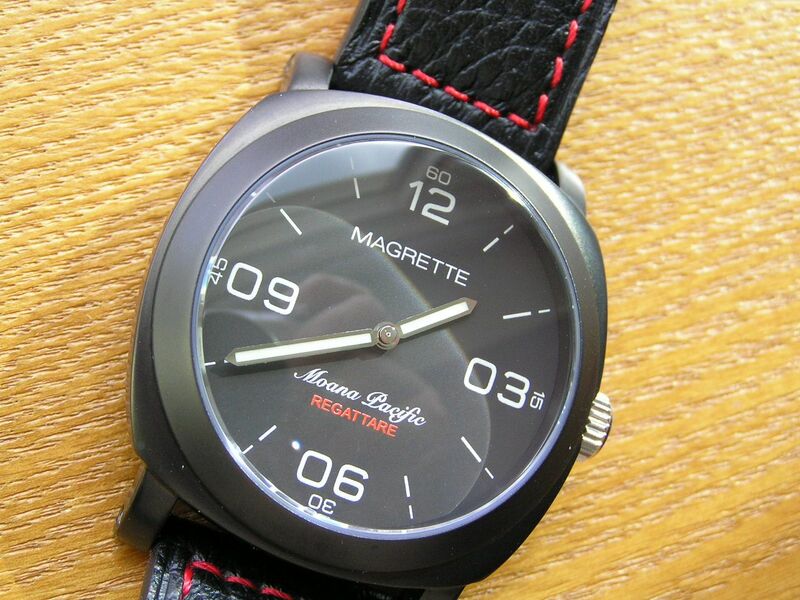 When I started seeing the Magrette watch brand pop up on several watch forums the last few months, I became mildly intrigued. Here is a small, boutique brand out of all places, Auckland, New Zealand (City of Sails, as is proudly proclaimed on the caseback), producing limited edition, limited run watches of acceptable quality and somewhat unique designs. The company has been around since 2006 and was founded by a chap named Dion McAsey, who actually signs the warranty cards that are enclosed with the watches one purchases. I’ll be the first to admit that I’m not usually a boutique watch kind of guy. There are just so many boutique brands around these days and most of them don’t seem to be doing anything original. The same could be said in part for Magrette, as the Moana Pacific is another in a seemingly endless stream of Panerai-inspired watch designs from an endless stream of companies. But the Moana Pacific is a bit better than some, although at this price point, it better be. The Moana Pacific was a limited 500 piece run which is sold out. 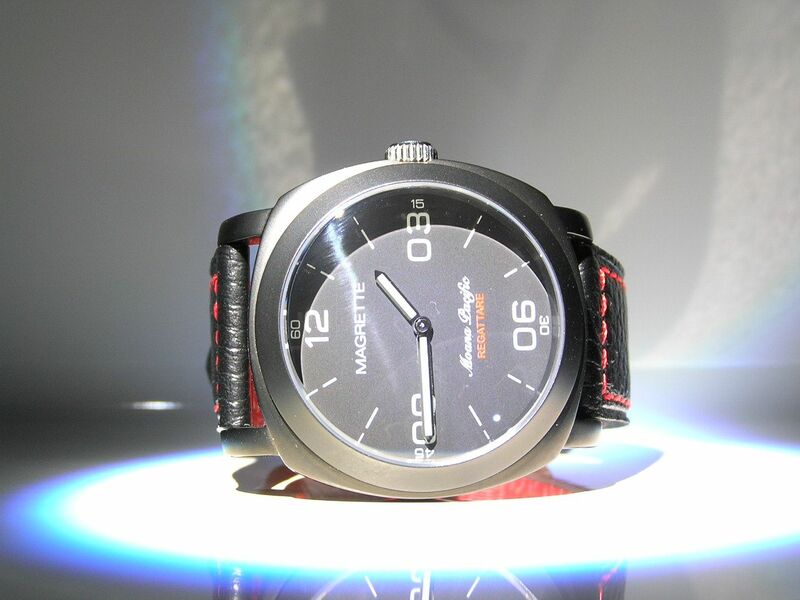 The watch starts with a 316L stainless steel case with black PVD coating. The application of the PVD is first-rate and is evenly applied to all case surfaces and is smooth to the touch. The case measures 43.5mm without the screwdown crown, 46.3mm including the crown. Lugs are 24mm, thickness is robust at 15.9mm, due in part to the highly domed (at least in my opinion) sapphire crystal. The caseback is black PVD and screws down, with a display window exposing not the watch movement as is typical, but a piece of ancient New Zealand Kauri wood along with the serialized limited edition watch number. 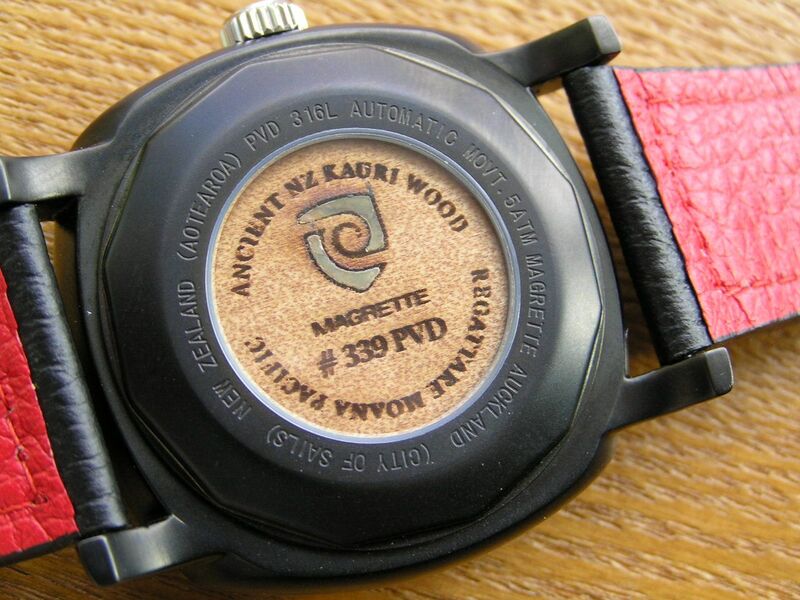 The wood has a cork-like appearance and is certainly something you won’t see on any other watch. 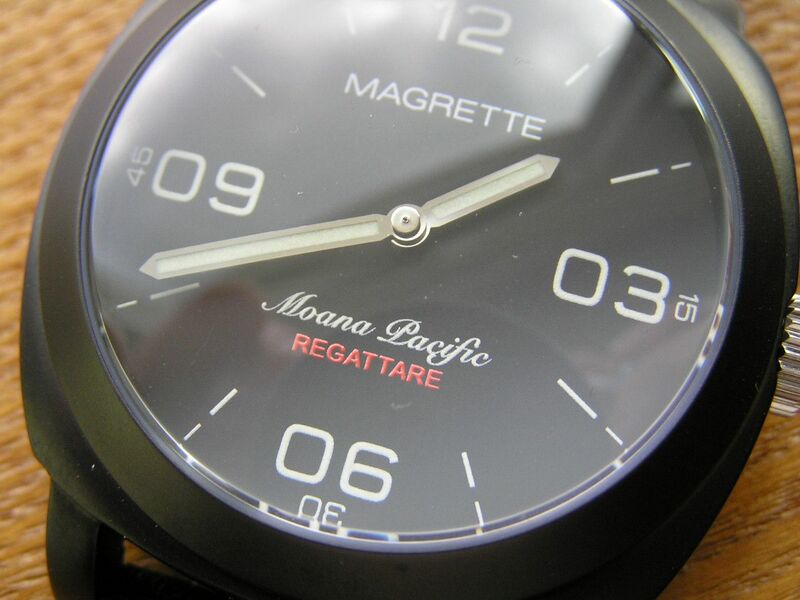 The Moana Pacific, despite its nautical leanings and naming, sports a very modest 5 atm water resistance rating. One odd design element is the stainless steel crown, albeit signed and screwdown, that is finished in natural silvertone stainless, not black PVD like the rest of the case. This tends to standout (not in a good way) and the only reason I can think this was done is because the crown sees the most wear, so to avoid the wearing of the PVD finish, the crown was left in plain stainless steel. 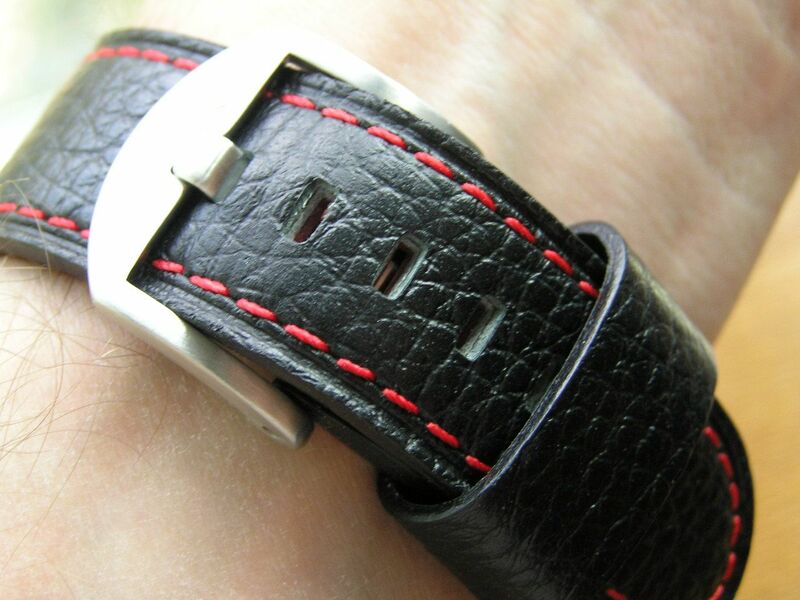 Ditto for the strap’s buckle, again, plain stainless and not black PVD. Again, my thinking is that the buckle would see wear and be subject to the ubiquitous ‘desk diving’ scuffs and scrapes, leading to deterioration of the PVD finish, so it, like the crown, was left in plain stainless steel. Powering the Moana Pacific is the workhorse we all know and mostly love, the Miyota 8200 series Japanese automatic. This movement keeps good time and can be manually wound, but not hacked. If you’re one of the people that is bothered by the occasional Miyota seconds hand jitter, not to worry on this watch, as there is no seconds hand present. No date either. It’s the McAsey ‘minimal’ design in action. I actually found the lack of a second hand, especially on an automatic, to be rather disconcerting. At this price point, I’d like to see the new higher-grade Miyota automatic that hacks or a Swiss ETA 2824-2 inside the Moana Pacific. 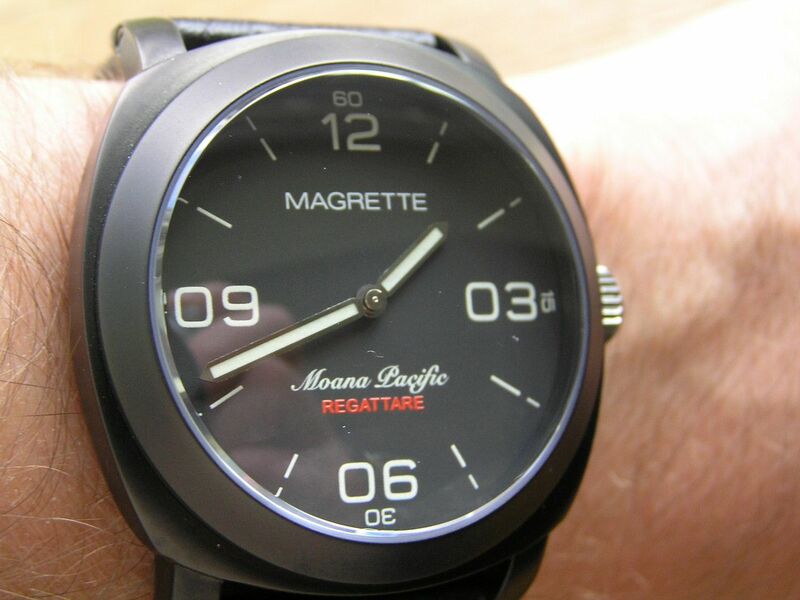 The dial is nicely done in a perfect matte black, with large arabics at the quarter hours, flanked by ‘60’, ‘15’, ‘30’ and ‘45’ arabics at each quarter hour, too. 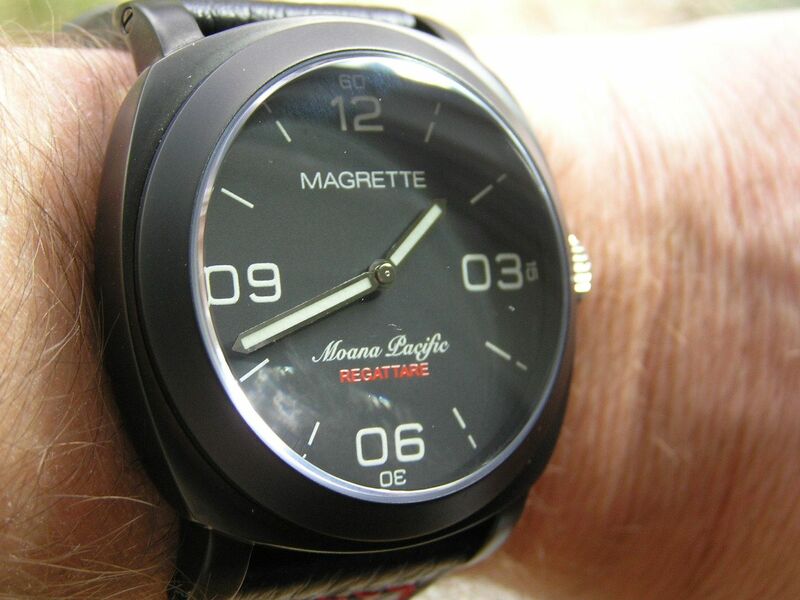 Magrette added zeros to the arabics at 3, 6 and 9 for a somewhat different look. There are also luminous markers at the five minute marks on the dial, along with luminous hour and minute hands in silver with lume infill. 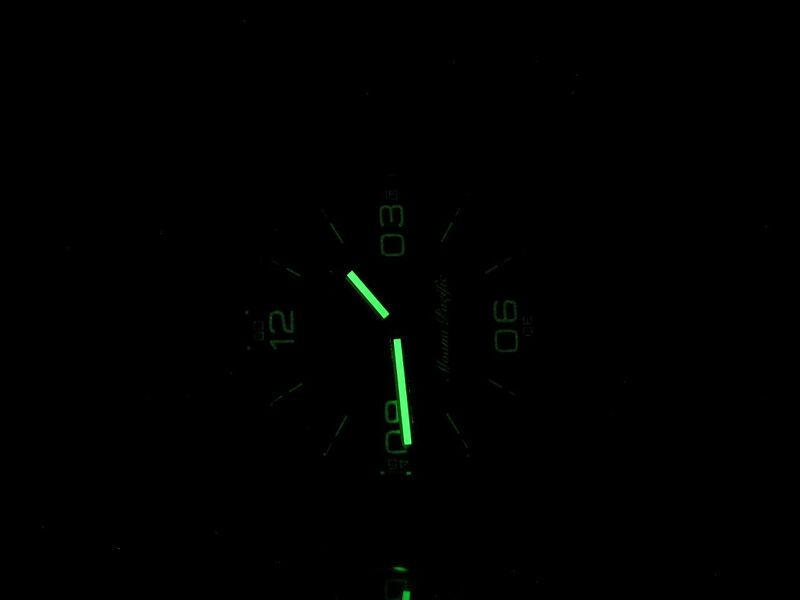 The lume on the hands is average, the lume on the markers and arabics (and the ‘Moana Pacific’ script on the dial) is not very bright or long lasting. They should do all the markings on the dial and the hands with superluminova and be done with it. The crystal is sapphire, but is thick and pretty well domed, leading to lots of reflections. Since there is no anti-reflective coating, the glare can get pretty annoying (and make the watch hard to photograph). 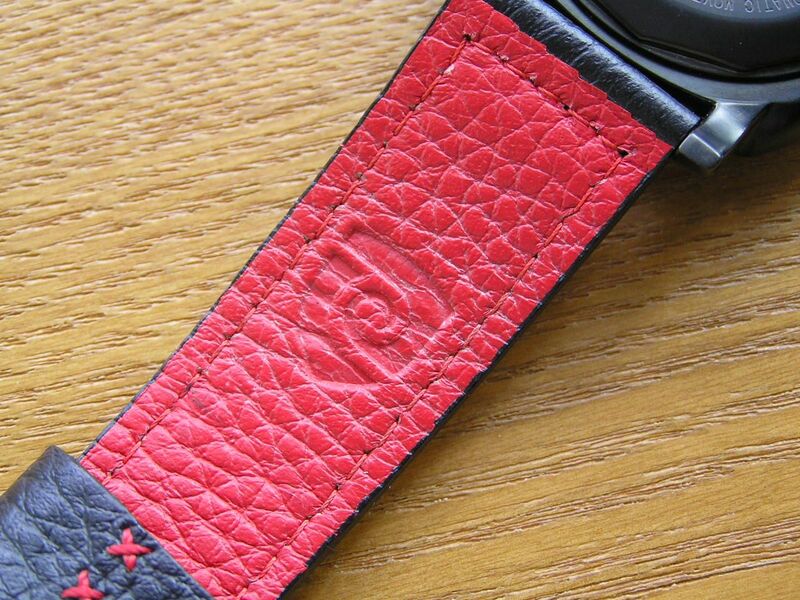 The strap is a thick, semi-padded leather style with a red lining and red contrast stitching. One large floating keeper holds the free end of the strap in place. 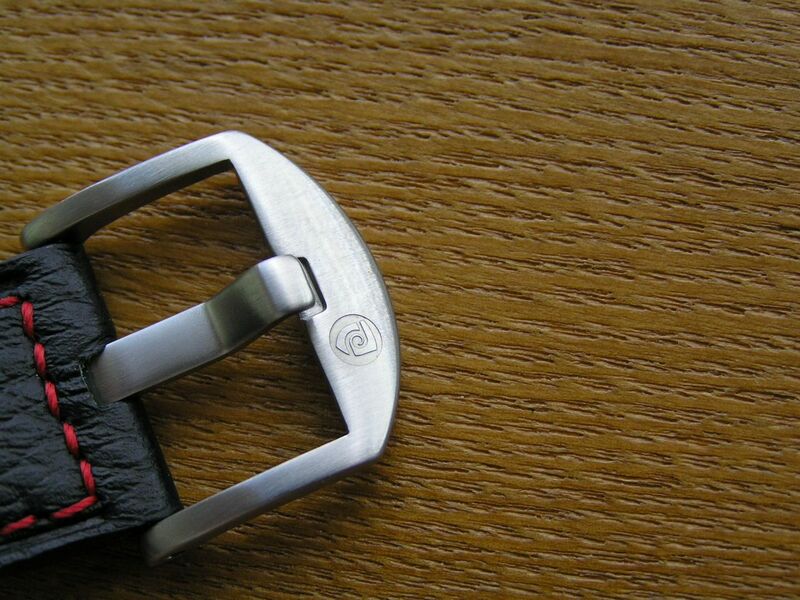 The signed buckle, as mentioned before, is silvertone stainless steel. 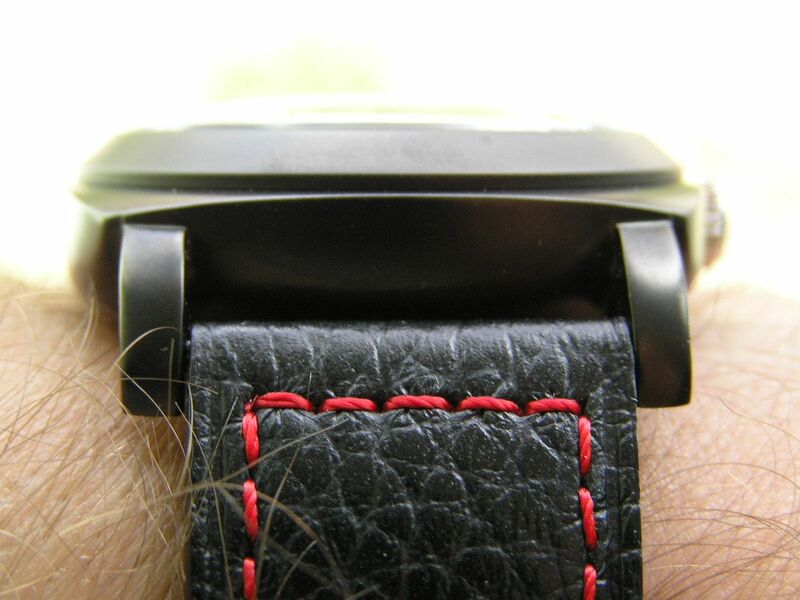 The strap is fairly soft and flexible and seems to compliment the watch well. 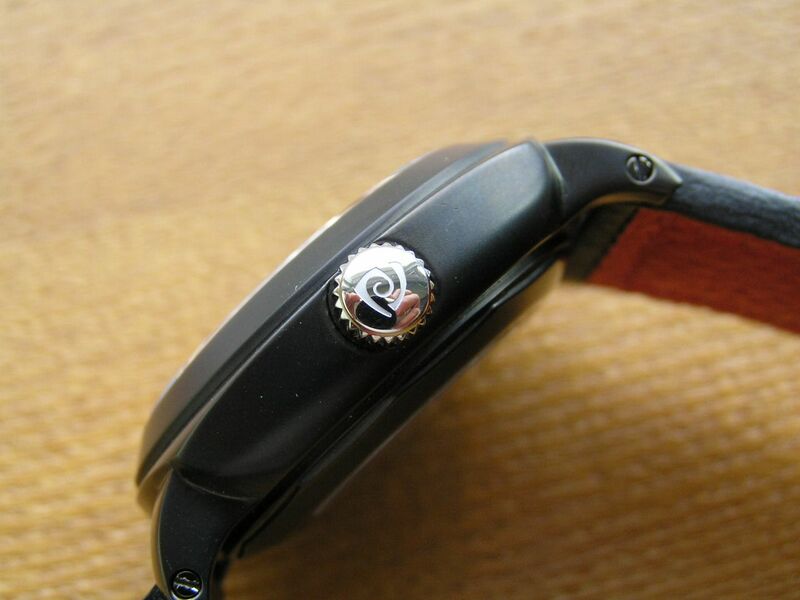 The strap is 24mm at the lugs and tapers to about 21.3mm at the buckle. The strap is held in place with screw pins at the lugs (the kind you need a screwdriver in each hand to remove). A nice touch, but I’d rather see them use regular spring bars and invest more in the movement. Packaging is rather unique, with the watch placed in a cloth roll-up holder, much like a tool holder that you might find in a vintage car. 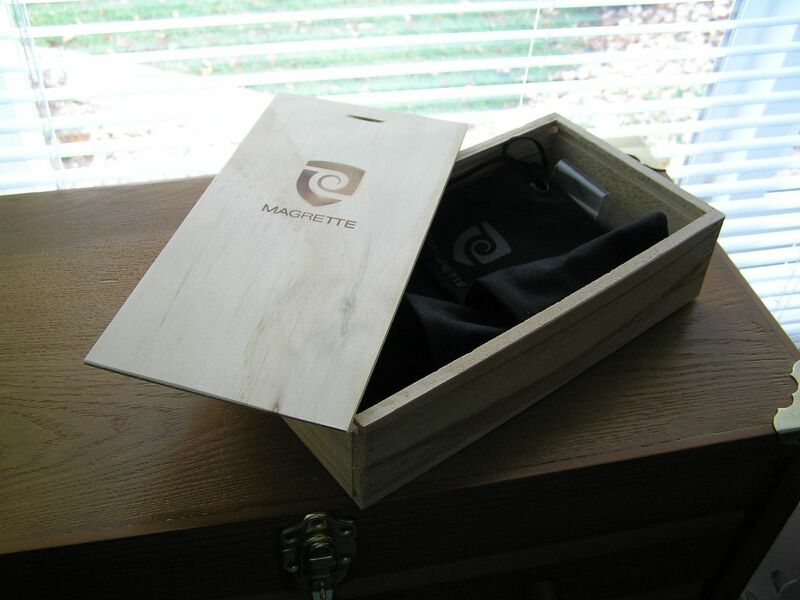 The roll-up is inside an unfinished wooden box with a sliding top, emblazoned with the Magrette logo. 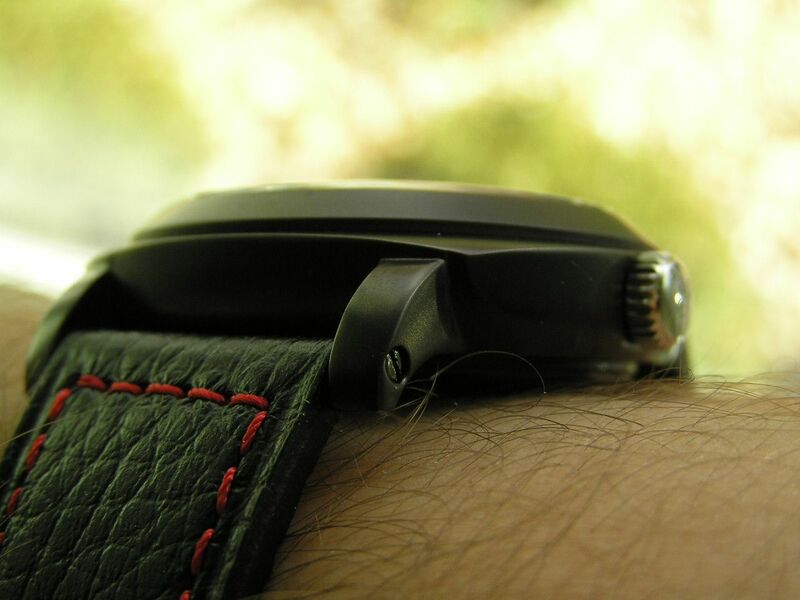 By reading this review, you may think I didn’t like too much about this watch. No, I admire it for trying to break out of the box with certain design elements, but in the end, there wasn’t enough here to hold my interest, especially at the $350 USD price point these go for on the secondary market. Verdict: another watch in a long line of Panerai-inspired designs from a myriad of manufacturers, this one stands out with high quality and a more individualized, unique approach, but tends to get pricey with just a Japanese automatic inside. If you must have one, you’ll do fine, but there are better values out there. I sold the Moana Pacific after only a month or so in my possession. The lack of a seconds hand bothered me and in the end, there wasn’t enough going on with this watch to keep my interest.